Description: This lab exercise demonstrates the required commands for DHCP Server configuration on a cisco router. 1. Issue service dhcp command on router R1 that enables and disables the DHCP server feature on router. By default, this is enabled. 2. 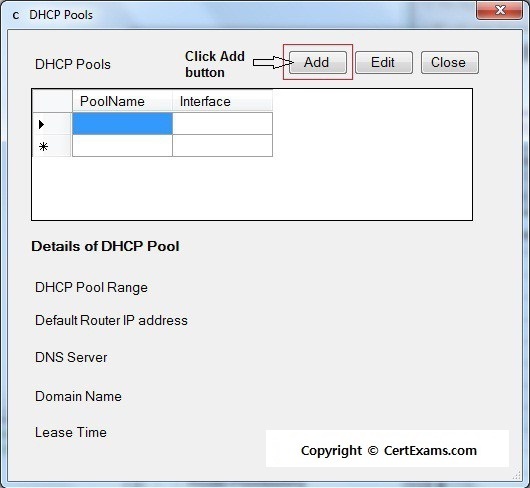 Create an addressing pool for dhcp. 3. Issue network command that specifies the range of IP addresses to be assigned to clients. 4. Assign the domain-name to the client. 5. In order to resolve Host names to IP addresses, client computers require the IP addresses of DNS (Domain Name Service) servers. Use dns-server command that allows assigning upto 8 DNS server addresses to the client, but however in simulator only 1 address is allowed. 6. Specify the default-router address using default-router command that allows assigning upto 8 default-gateway addresses to the client for this range of addresses. 7. Specify the duration of the lease, which if omitted results to default 1 day. 2. 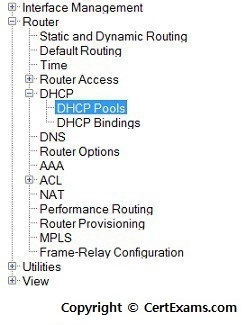 Create an address pool using Router > DHCP > DHCP Pools. 7. Default-router 192.168.2.1 and lease 2 days and click OK button.